The last thing you want to discover is that one of your employees is stealing from your small business. Not only is it a total violation of your trust, but internal fraud also has the potential to put you out of business. According to the Association of Certified Fraud Examiners, businesses lose an average of 5% of revenues each year to fraud. Could your company survive if an employee stole 5% of your revenues? Is an employee struggling with personal problems? Employees with financial troubles, addictions, chronic legal problems, instability in their personal lives, or unusual work habits might be more likely to commit the fraud. Are accounting errors popping up? A company's accounting process and financial records might also point to an ongoing fraud. Some of the best business software will alert you if bookkeeping entries don't line up the way they should. Are you putting too much pressure onemployees to meet sales targets? When financial goals loom large, industry conditions are difficult, or employee bonuses are on the line, fraud may help ease the burden. Are you too loose with company keys and passwords? Companies that have lax policies and procures are more likely to be defrauded. Allowing employees too much autonomy can also create an environment in which fraud goes unchecked. Do you actively encourage honest, straightforward business dealings? Management must model ethical behavior and enforce the code of ethics in order to prevent fraud. This post just scratches the surface of a complex topic. But if you want to know more about fraud risks and indicators check out my new book. 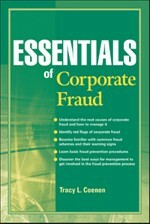 In Essentials of Corporate Fraud I go into a lot more detail about how the most common frauds are perpetrated and the ways small businesses can stop fraud in its tracks. You wouldn't leave the company's doors unlocked overnight, would you? Don't leave the company's assets, information, and money exposed for your employees to steal. Learn about fraud and start preventing it in your company.